Well, that seems to me astonishingly restrictive on Daz's part not to allow a side-by-side comparison. Why on earth not? Suggests Daz fear the differences/improvements may not seem all that compelling if scrutinized in that way. That is why there are betas, to try the new features, etc. It's the same with any application or Operating System; Windows, Adobe, etc. This may be a dumb question, but does moving to 4.9 mean that you cannot use 3rd party items? I don't think so as they are not encrypted, as far as I can tell it's only the encrypted Daz content that can only be used with DS 4.9. All older content should still be able to be used. It can still be used. Can someone please advise whether upgrading to 4.9 will force an install of Postgres/CMS on me? I do not use Smart Content - the Content Libary is fine for my needs - and have no wish to have a socking great database running just to tidily organize a few bits of metadata I'll never use (*cough* SQLite? *cough*). I have never installed Postgres with 4.8: would I be able to avoid installing Postgres/CMS as part of a 4.9 upgrade? The smart content improvements don't entice me, and I'm seeing people say their custom categories are gone or not working, so that's another reason to wait. I'd still like a more efficient (for me) way to organize custom categories (folder by folder is still too slow, and don't get me started on sub-categorizing within a folder icon by icon) but I know my preference for working with text/spreadsheets is something of an outlier among DAZ artists. If when you scan for new content and mark, then you go to the folders in either Daz or Poser section and right click and select create new category, you can not only do the folder but also chose to include subcategories. I do it all the time and then right click to mark as seen. I miss the ability to drop and drag folders and have them merge with the same name still but this works better than single folders. I used to organise from unassigned. I don't touch that or even look at any more. Draw the skydome and it doesn't. I use Carrara for most of my production work. I use DAZ Studio for some specialized work and testing. I installed Studio 4.9 this morning, but soon found out that it only recognizes Postgre, so I no longer have any access to my DIM content library (or smart content) which I use with Carrara and Valentina. Is DAZ providing a way to downgrade back to 4.8? If so, what is the link? Otherwise, DAZ Studio 4.9 is unusable for us until there is a normalization of the Postgre database between the two programs. Against all concerns and all the problems of a big number of customers they now released 4.9. I have still open bugs which are not solved since several months. Please tell all those customers, whose security system is one of the most popular (ZA) how to get PostgrSQL running. When I get home from work should I file a bug report on my situation Spooky? Or do you have some solid advice for me surrounding the CMS connectivity issue? I don't understand Smart Content product filtering with the search bar. I selected All in the left column, All along the bottom row, and unchecked Filter by Context. I entered sp in the search box, to find products that start with "sp". The results listed a few products, none of which start with "sp" or even have an "sp" in the name. How does this work? DS 4.9 in application prices don't match web prices! Victoria 7 Pro $35.10 inside DS 4.9, but only $17.90 in the web store today. Y'know, I'm kind of with DavidGB on this- I don't like that this new release basically feels like 4.8 with new-and-improved DRM. If it weren't for Smart Connect, I would consider downloading and installing 4.9, but the way it's being shoved down our throats makes me think that I can do without it. For the record- and, please, correct me if I'm wrong- all I need to do in DIM to make certain that I won't "upgrade" to 4.9 is to hide the packages, right? Betas are ideally for beta testers to identify bugs which hopefully get fixed before the full release. I don't 'do' betas, or at least not on my own time. Operating systems are not analogous, and besides I have both Win7 and Win8 on this very machine, dual booting so that doesn't support your point. As for applications, it's not the universal to prevent simultaneous installation of multiple versions, as you seem to think. For example, I have more than one version of the Oracle database installed on my work laptop. If they can allow multiple versions to co-exist for that beast, I'm sure Daz could have for their comparatively simple application. They clearly chose not to do so. The question is why, other than to 'encourage' the use of Daz Connect and in the belief that in-app purchases will increase sales. That would be legitimate, but disappointing. I could try 4.9 on a virtual machine, but that would mean no Nvidia graphics for Iray, so the performance improvements would be obliterated. "I use my content on multiple computers. Can I still do that? Products can be installed and used on an unlimited number of computers, but you can only be actively connected with a limited number of computers at the same time. 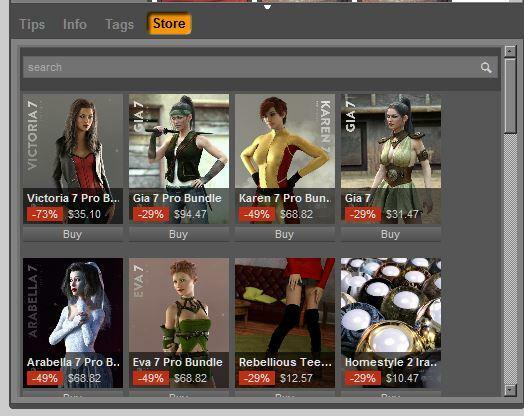 In fact, using Daz Connect makes this easier than before, as any computer you log into will have access to your purchased products directly within Daz Studio. There is no need to carry around your installation files—simply login and download your products on any machine." Now, if you've been following along what was said on the page you actually have to jump through an extra hoop to get to, it says something slightly different: Specifically, it says, "Products can be installed and used on multiple computers, but you can only be actively logged in on one computer at a time. In fact, using Daz Connect makes this easier than before, as any computer you log into will have access to your purchased products directly within Daz Studio. There is no need to carry around your installation files—simply login and download your products on any machine." Interesting, that. I suppose it's fair to say that you are only allowed to actively use content on a "limited number" of machines at the same time- one is, after all, a VERY limited number. And, sorry, anybody who wants to use one computer to pose an image and another to render an image at the same time- you're S.O.L. I'm afraid that is a ZA issue, and you need to thump on them.As it has been an open issue for over 5 years, the feeling is that they just don't care. Here's Rob's post on ZA and PostgreS http://www.daz3d.com/forums/discussion/comment/593430/#Comment_593430 - I've done a minor bit of research on this, and (personal opinion here) I think the issue is intentional. I have no idea why, but the problem has been outstanding for years with no fix from the ZA people. I've installed 4.9 and I'm VERY disappointed... I can't see anything in the content library; there seems to absolutely NO content. When I switch to smart conten view it's all there but I really would like to use the content view. But there's a MUCH bigger problem: Genesis 3 skin looks HORRIBLE even if you use the (last version) of the octane plugin and the redspec shaders. And subdivision isn't working at all; I've tried all possible settings (now I'm at "render SubD 5" but the arms of my poor G3 seem to be very rough; I nearly can see the underlying mesh at a very low resolution. That's soooo ugly. What can I do to get a normal render again...? Is it possible to go back to 4.8? I'm glad that products that predate 4.9 will still be available without Connect, but will all new products require it? I'd just like to know whether there is any point in checking out new releases from now on. IF I upgrade to 4.9, I won't be using Connect. I'm just not comfortable with it, and see no added value to using it. If need be, there are other sites to buy Daz/Poser content. Good Advice! I don't want duplicates. This seems like a long tedious process, because I don't want to install everything I own. I'll have to sort through it all again. Must not be taking your PC+ subscription into account. 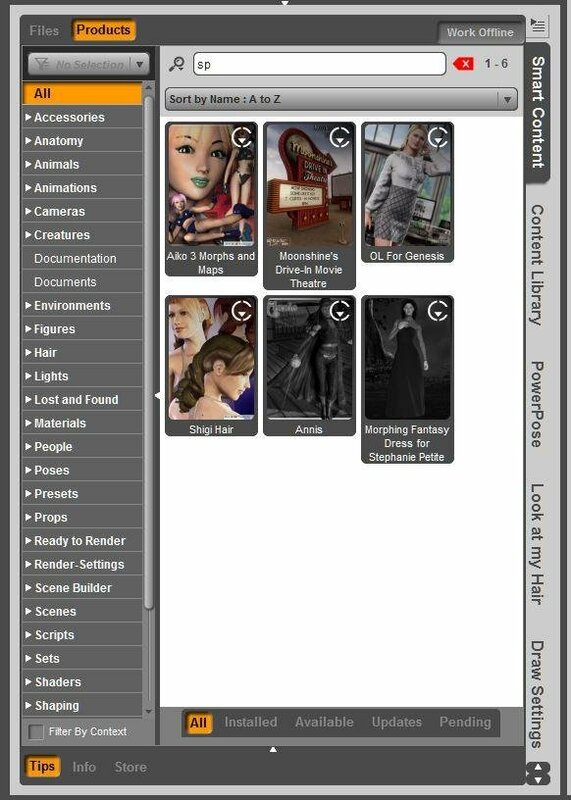 Do you have the content paths correctly specified in Content Directory Manager under DAZ Studio and Poser Formats? Are today's character updates only for 4.9? I tried to download them several times, but they failed each time. I'm still having trouble with M7 and V7, but the rest eventually loaded okay. I did hide all the updates that were labelled as being for 4.9, though. Mainly, I suspect the issue is that there are a lot of people currently in the process of downloading the new build- whether they want it or not, in many cases- and the servers are just backed up. EDIT: DIM finished with M7 and V7 updates while I wrote that last bit.